The CM said this after a meeting with officials from the World Bank in Thiruvananthapuram on Tuesday. 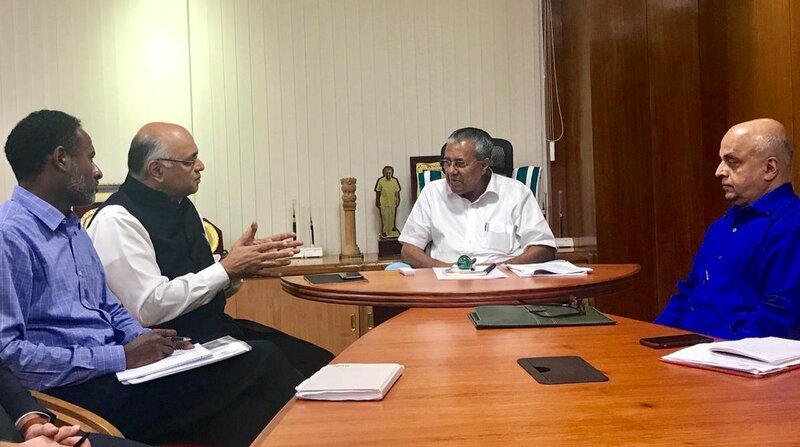 Following the meeting, World Bank India reaffirmed its support to the rebuilding and reconstruction efforts in flood-ravaged Kerala. Recognising the long-term impact of natural disasters such as the one witnessed in Kerala, Junaid Ahmad, the Country Director of World Bank, India, said that such an event “can roll back decades of development and are a fundamental threat to economic development and the fight against poverty”. “The World Bank stands committed to support Chief Minister Vijayan’s vision of converting this tragedy, the biggest the state has seen, into an opportunity to build a more resilient Kerala for its people,” he said. In September, the Kerala government had decided to raise Rs 15,900 crore as loan from the World Bank, Asian Development Bank, and other funding agencies to rebuild the prime sectors of the state devastated by the deluge. Vijayan had told reporters that the amount would be utilised for repairing and reconstruction of roads under PWD, local self-government institutions, water supply, flood control and irrigation systems, coastal area protection, rehabilitation of people in coastal stretches, and other necessary infrastructure. The WB-ADB team had visited Kerala from 12-20 September and conducted Rapid Damage Assessment and Need Analysis (RDNA) and their report has been received by the state government. The report said that the main sectors of the state had suffered a loss of Rs. 25,050 crore.